A standard accommodation option in Kratie, this place is the last accommodation available before going into Mondulkiri. 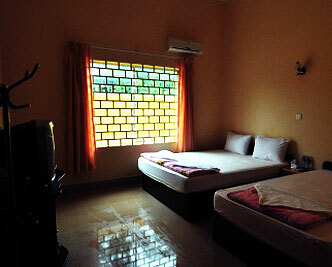 It offers very basic and simple rooms. ※Hotels outside Phnom Penh and Siem Reap require a USD 10 standard booking fee to be added upon reservation. ※Kindly note that the price was updated last January 2009 and rates will or might change without prior notice. ※For late check out fees, kindly contact us. ・ Please be reminded that hotels in Siem Reap would normally have their Gala Dinners on the 24th and on the 31st of December every year to celebrate Christmas and New Year. Under normal circumstances, these dinners are on a compulsory basis so you must pay an additional fee. For more details, kindly click here. ・All rates are in US Dollars. We strictly follow a 1 room per night basis. Price also includes 10% government tax and service charge. ・Kindly note that if there are no room type specified in our hotel information sheet, it would automatically mean that it is a standard room. ・Prices may change anytime without prior notice. ・Kindly note that children aged under 2 years old is free of charge, 3 to 12 years old is half the price and 12 above will be charged with a full rate. Kindly note that this condition is sometimes changed due to hotel's original policies. ・Late check out before 18:00 PM will be charged with 50% off the room price and a 100% charge or 1 night shall be imposed if late check out is done after 18:00 PM. ・Room facilities mentioned above may sometimes be available on a per request basis. Some amenity photos may vary from actual item. ・We will not be held liable for misconceptions that may occur between the hotel and the client with regards to what we have stated here on our website. We try to post the most accurate and up to date information as much as possible however, some information might be changed without prior notice and as such is beyond our control and we shall not be held responsible for it. SKETCH TRAVEL CAMBODIA provides hotel, tour, VISA and ticket arrangements. We have a 24-hour customer assistance service hotline to help and support any travel inquiry you might have while on holiday here in Cambodia. We also have a KRORMA TOURS DESK located near the Old Market (Phsa Chas) in Siem Reap and one more KRORMA TOURS DESK located in the capital city of Phnom Penh. Both branches are ready to assist you with any additional travel need you may require. Phnom Penh Tour desk operation hours is from 9:00 am – 17:30 pm during weekdays and from 9:00 am – 12:00 noon on Saturdays and is closed during Sundays and during Cambodian Public Holidays. Siem Reap tour desk is open daily from 9:00 – 19:00 pm. Enjoy a hassle free vacation every time you use SKETCH TRAVEL CAMBODIA. Our team's extensive knowledge on the destination and our commitment to service makes us a reliable travel company that you can surely rely on. Discover the adventure ahead! Start planning your vacation with us. to maxisimize the security of your online privacy.